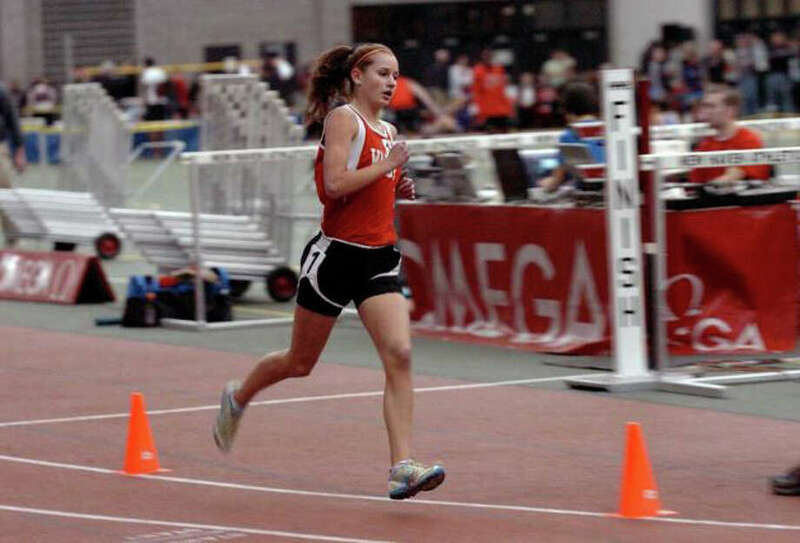 Warde's Cate Allen was a New England qualifier as a freshman a year ago, and likely will star for the Mustangs in the 1,600 meter run in 2011-12. The Fairfield Warde boys indoor track team is poised for greatness. The Mustangs have added better sprinters to an already talented distance clan to make up a terrific club in 2012. "We're deeper than we've been in the sprints," coach Tim Foster said. "And we returna great distance core." Leading the way will be the senior Warnick Brothers. Harry is coming off a cross country season in which he finished fourth at New Englands. He'll be Warde's top 1- and 2-mile runner. His brother, Sam, will be a middle-distance runner. Foster will continue to coach the distance runners and they're a strong group, even besides the Warnick's. Tong Liu was an all-FCIAC distance runner a year ago. Connor O'Day will be one of the better distance runners in the league too. Nick Ganz and Aidan Fiol are sophomores who are expected to excel. "We lost very little and they have a year more of experience," Foster said. "They're a good group." The sprinters will be led by senior Nick Imperioli. Sophomore Kyle Millington has burst on the scene as a first-time varsity runner. Juniors Drake Bist, Ryan Gavey and Jean-Pierre Ritchey all will sprint, although they do lack varsity experience. "The sprinting core brings a new element," Foster said. Peter Lombardo and Ben Gallati will be two of Warde's better hurdlers in 2012. The Mustangs will be better, but Foster realizes how hard it is to show it. "The FCIAC is so strong," he said. "I think we have a better team, but that's all relative." Warde was ninth at FCIACs and 11th at Class Ls and Foster thinks improving on those are likely. "We hope we can finish in the top-eight at both," he said. "Hopefully we can get as many to the State Open as possible."